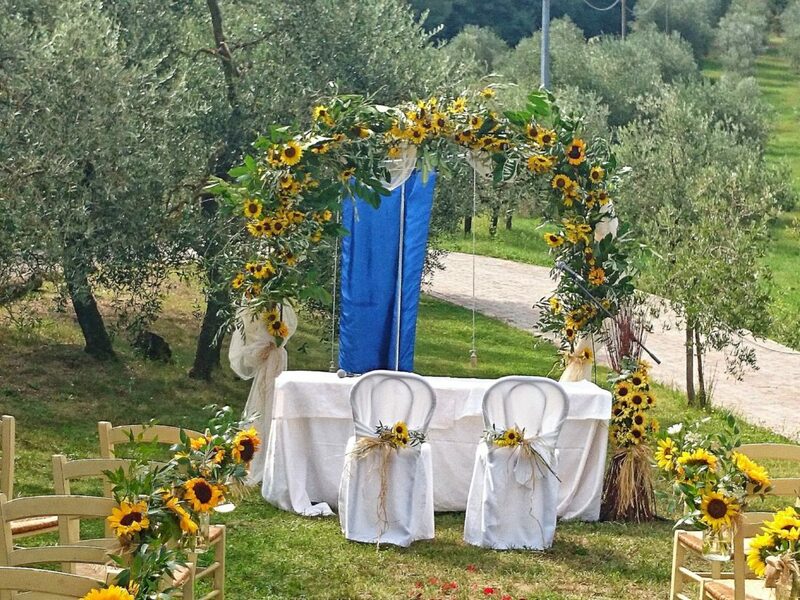 Many artists have been drawn to the Tuscan sunflower fields – and the picture of the flowers’ faces turned towards the sun makes a perfect backdrop for an alfresco wedding. If you’re looking for a simple yet elegant and inexpensive flower to use in your bridal bouquet, then why not consider the sunflower? These flowers are grown throughout Tuscany and are reminiscent of the joy and sunshine to be found in the region. At BeA Alfresco we suggest that you use the sunflowers for all of your wedding bouquets, and also feature them when you create the wedding table flowers at your reception. These can be easily created by placing one large sunflower on the table, with perhaps some smaller flowers around it. Mini sunflowers can be used in the wedding corsages for the mothers of the bride and groom and other ladies in the wedding party, and the boutonnières for the groom, best man and ushers. There are many different varieties of sunflowers you can use for your bridal bouquet and those of your bridesmaids – from the large flowers with their thick stems to the smaller versions which are only about 2 inches across – and some are even available as double flowers. They also come in a variety of colors, not just the familiar bright yellow; there are bi-colored sunflowers, almost red and rust-colored sunflowers, apricot and cream sunflowers. The centers of the flowers also can be different – from the familiar dark chocolate color to yellow and even lime green. If you are using the large sunflowers you will only need four or six of them for your bouquet, along with some leaves, and possibly accent them with white carnations or dahlias, purple freesias, different colored daisies, and baby’s breath. If you are having a rustic wedding you could simply use the sunflowers alone and have them firmly hand-tied with ribbon; as their thick, strong stems are sturdy enough for you to hold without wiring or wrapping them. They make an elegant yet simple bouquet. The smaller sunflowers may offer greater creativity for your bridal bouquet, and of course, should be used for the corsages and boutonnières! You will need eight to ten small sunflowers if you want a posy bouquet, and they can be simply accented with leaves and baby’s breath or with other colored flowers as in the large sunflower bouquet. The sunflower is an ideal choice for a summer or fall wedding in Tuscany; and as it represents long life and loyalty, it is the perfect choice for your bridal bouquet.